Haggling is part of everyday life in some countries, such as India, Vietnam, and Egypt. Vendors are known to inflate prices for tourists and are very skilled in getting foreigners to pay more than they would charge other locals. This goes for everything from backpacks to t-shirts to fruit to tuk tuk rates. Knowing how to successfully negotiate prices will help ensure you aren’t taken advantage of and overcharged. Creating a backup plan or two before you start haggling is important in case your first strategy doesn’t work. Plan A could be basic price negotiation. Should that fail, you enact plan B, which could be walking away or threatening to go to a competitor. Plan C could be more creative, like having a travel partner step in or offering to buy multiple items at a set price. 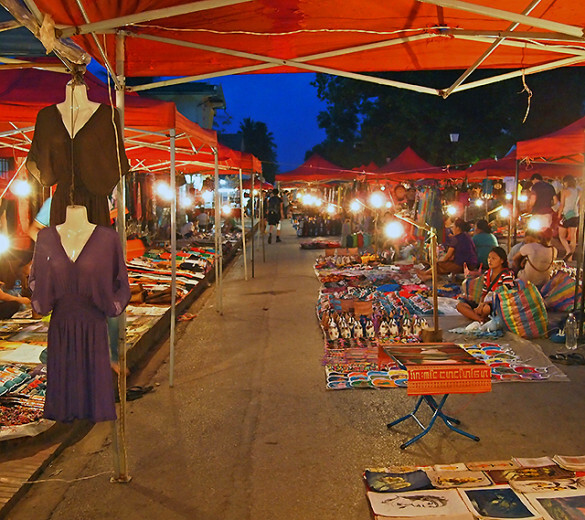 You can haggle for a good deal at the Luang Prabang night market. While walking down a small side street in Fethiye, Turkey, we came across a table set up with bottles of perfume and cologne. There was a wide variety, like you would find in an airport duty free shop. Mike stopped to look at the selection while Tara stood uninterested a few feet away. The Turkish vendor manning the table came up to Mike and offered cologne suggestions and prices. His initial offer started high, as street negotiations do, and Mike showed hesitation upon hearing the price. This caused the vendor to lower the initial price without Mike having to say a word. He landed at 50 lira, which was still too high for Mike since he knew they were knock-off products. Mike counter-offered with 10 lira. Of course that’s a laughably low number, but the key to agreeing on a price you want to pay is to start low to bring the seller’s offer price down (this was plan A: plain negotiation). After a couple minutes, Mike got him down to 25 lira, but it didn’t seem like the seller was willing to drop below that. That’s when plan B kicked in, and Tara stepped in to the conversation and offered to buy two bottles for 30 lira. Sold! As Americans who never haggle for goods at home, we went through trial and error until we got used to negotiating. It’s a skill we wished we had developed or even researched a little before leaving for our 14-month RTW trip. As we traveled, we discovered many other skills that also fell into the “wish we knew about that” category. It’s easy to overlook or not even consider learning these skills when you’re planning your career break. 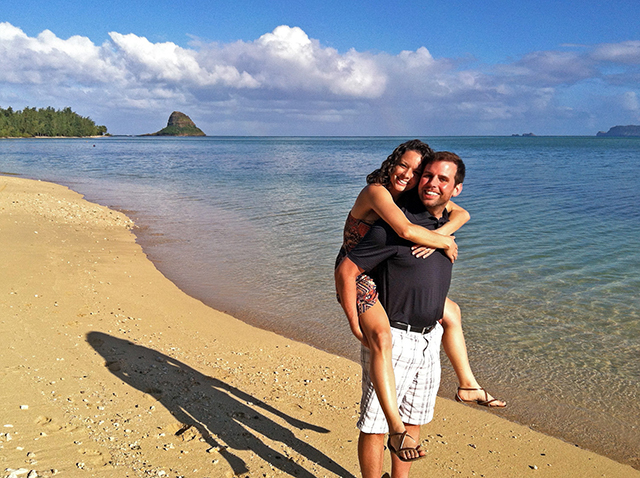 After all, you become consumed by figuring out how to save more money, sell your possessions, and plan a smooth transition from working 9-to-5 to a life of full-time travel. 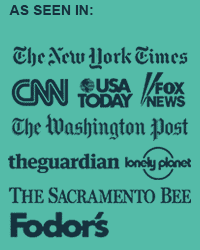 That’s why we included a whole chapter on these skills in the travel-planning book we just published, called Create Your Escape: A Practical Guide for Planning Long-Term Travel – because you don’t have time to think of everything yourself when you’re planning your big trip. There are a lot of skills you can and should learn before leaving, but we’ll focus on a few other important ones here. Accidents happen even if you aren’t the clumsy type. You might wipe out on a bicycle or trip and scrape your knee while hiking. Knowing how to properly clean and bandage wounds will help ensure you don’t get an infection. And, just as important, you should know which first-aid items you should pack in the first place. Sure, you can purchase antiseptic and bandages on the road, but it’s a good idea to have a starter kit in case you need it in a remote area or after hours when shops aren’t open. 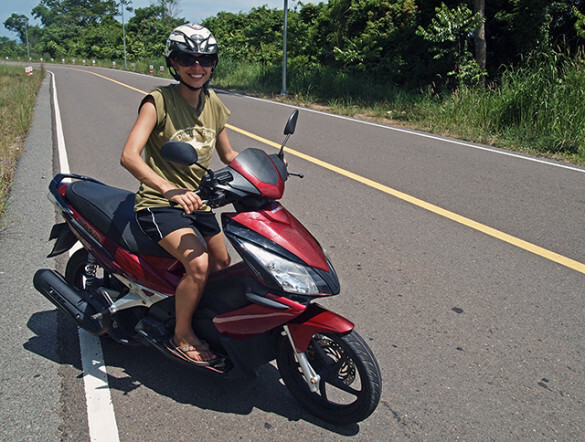 Tara not really driving a motorbike in Kampot, Cambodia (more like posing). She never learned before the trip so Mike was the driver – just to be safe! You don’t want your skills (or lack thereof) to hold you back from cool experiences while traveling. You might have an opportunity to rent a car or motorbike for a day trip or coastal drive, and you shouldn’t attempt to drive either vehicle if you don’t know how. When we were in Southeast Asia, a local said to us, “You see all the foreigners with bandages or casts? Those are likely the result of a motorbike accident.” It’s true that many people underestimate motorbikes and scooters and think they can drive them with ease. Fully automatic motorbikes might be easier to drive, but many rental companies only offer semi-automatic and manual options. You have to be skilled in driving this type of vehicle to be successful, otherwise you risk endangering yourself and others on the road. Likewise, many rental cars around the world are manual, and it takes practice to understand how to drive these vehicles. You could ruin the engine if you incorrectly use the clutch and don’t know how to properly shift gears, and that might cost you a pretty penny to replace. Plus, stalling out in the middle of a street (at a light or stop sign) could cause a traffic jam or even an accident depending on the flow of traffic. A new country with different road rules than your own is not where you should learn to drive a motorbike or manual car. Sign up for a class at home so you feel confident using the vehicle and learn how to be a defensive driver. Doing this will not only ensure you don’t have to pass up an opportunity to rent a vehicle, but it may also help you in an emergency situation where you have no choice but to get behind the wheel. Tara swimming in the Mediterranean off the coast of Turkey. The underwater world is incredibly beautiful with its colorful coral and curious fish. You’ll likely have at least a few opportunities to snorkel or even become SCUBA certified if you want. 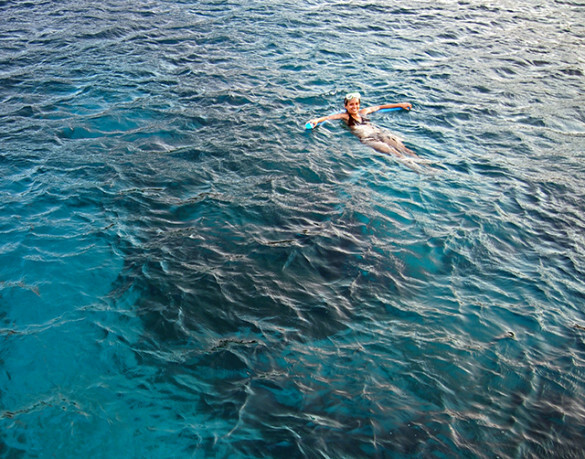 You could see the majestic Great Barrier Reef or even watch manta rays swim inches below you. Even though you could use a life jacket or inflatable tubes to help you stay afloat, you really should be confident in the water and know basic water safety if you’re going to splash around in it. Being a skilled swimmer isn’t just important for water-based experiences, but it could also save your life in the event of an emergency. If you’re not comfortable in the water, take lessons before you leave until you feel confident enough to float, tread water, hold your breath under water, and swim to safety. 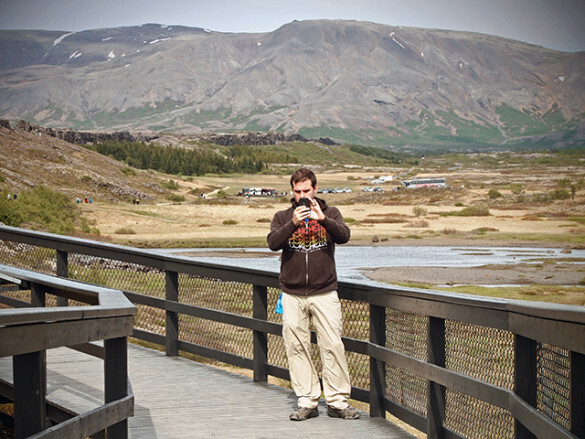 Mike taking photographs in Iceland. You’ve probably perfected your selfies, but leave the selfie stick at home and turn the camera around to capture the incredible and inexplicable moments of your trip. These are images you’ll be showing others and looking at for the rest of your life, so you should know how to take a sharp, well-framed, and interesting shot, as well as edit the files to enhance them even more. The first step is learning to take great photos, which you can do through an online course or by reading a book and then practicing every chance you get. Then take it one step further and learn the basics of Photoshop or another photo editing program so you can make your images look even better. You’ll want to understand resizing, color correction, and working with shadows, midtones and highlights. Those are very basic concepts, but they’ll help you create a more vibrant image than your camera may have captured if the lighting was poor when you snapped the shot. To know what else you should learn before hitting the road, check out chapter 6 in Create Your Escape. It’ll give you good ideas of what to expect in foreign countries and make you an even savvier traveler.